A true rite of passage: I made my first souffle. And I see the world differently now. Mostly because I measure time in terms of how much of it will elapse between souffles. Souffle needs to fire its PR agency. It has allowed itself to be placed, in popular perception, at a level of culinary skill somwhere between tete du veau and sous vide of goat and a more unfair reputation you will not find. The general cooking public has come to believe that taking on a souffle is akin to banking on Lindsay Lohan to carry your next movie: highly risky and the outcome far from certain. But listen, if you can whip egg whites properly, you can make a souffle. Yes, it’s true, you can’t slam the oven door repeatedly while it’s cooking. And I wouldn’t do any jack-hammer crafts or clog dancing near your kitchen. But aside from that, souffle does not ask anything more than to be put in the oven and left alone for 40 minutes or so (and I know exactly how it feels sometimes). This one is cheese. Gruyere cheese. It tastes like a giant, fluffy Cheez-it cracker only with a more interesting cheese flavor. When I thought about making this I was initially nonplussed about what to serve it with. Or what to serve with it. Is it a main dish? An appetizer? A floor wax? I ended up with another Dorie recipe for asparagus salad and it was a brilliant pairing. So, bottom line: Lindsay Lohan = volatile and unpredictable; souffle = not so much. And looks so fresh and lovely. Just the way Lindsay Lohan used to – in her “Parent Trap” days. Yes, her last moments on an upward trajectory. Amazing that you can get souffle and Lindsay Lohan in the same sentence. Three cheers for you and your souffle. I concur with Dorie! Amazing! Such a clever post. Lovely souffle too! I just bought a madeleine pan yesterday because I want to celebrate finishing Proust at the end of this year by making, of course, madeleines! Seriously, I can’t stop cooking from your book. I also went rouge this week and made Marie Helene’s Apple cake for the third, THIRD, time. At least you tried something new! Congrats on the soufflé, looks divine. 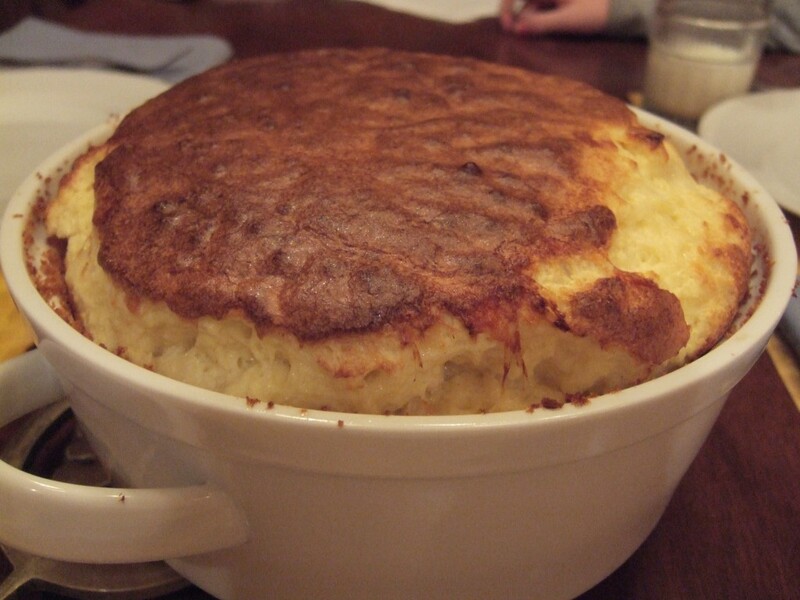 Yeah, souffle is a weeknight dish at our house. If you don’t get all restauranty about it, making souffles is quite easy … it’s just a white sauce and eggs. My wife’s grandmother used to make “American Cheese Souffle” it to get through WWII food rationing; there was always gov’t cheese, and their family had chickens. Oh, two other comments: (1) it’s a main course, serve it with a green salad. (2) if you ever come to SF, there’s a delightful restaurant which serves *nothing but souffle* in North Beach.